Food, glorious food, hot sausage and mustard! These words from the musical, Oliver, certainly convey a child’s love affair with food. For children, eating is usually viewed as the fun part, while cooking the meal can seem like drudgery. A good parent knows, however, that children must learn how to cook in preparation for adulthood. 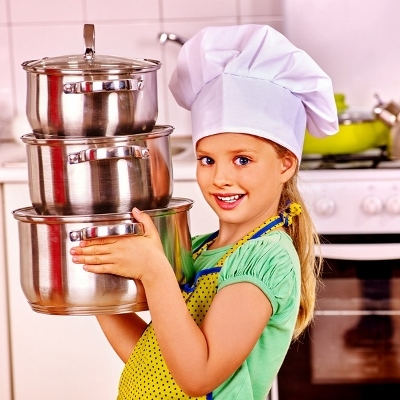 Set a goal to begin cooking with your tween in order to promote this important life skill. You will find in addition to spending quality time together, it is certainly fun to eat the results of both your efforts. For tips on making cooking with tweens fun, read this informative post. Recipes can be easily found on the Internet, yet a recipe book offers a more sensory experience. Remember looking at the pages of your mom or dad’s recipe book and seeing stains from past cooking experiences? The dirtier the page, the better the recipe! Vow to give your child this memory as well, and you will help equate cooking with positive feelings. Follow this link to a Chicago Tribune article which lists the best age appropriate cookbooks. What better way for a budding chef to learn about cooking than from the experts? For example, Taste of Home sponsors in person cooking demonstrations at locations across the United States. Click here to learn more about these interactive events. Other companies also offer dynamic cooking demonstrations. Find one that you feel will inspire your tween concerning the culinary arts. Children tend to eat what they grow; therefore, planting a garden will provide a tween the opportunity to nurture plants from seed to harvest – and finally to the table! Even if you don’t have a large yard, you can still plant a windowsill herb garden. In addition to having fun, your child will experience a sense of pride in cooking something he or she grew. This may be the hardest part of letting a tween cook – actually allowing him handle the tools and to be near a stove/oven. Imagine an 11 year-old watching you cook. You chop, you measure, you boil, you fry, you put the cake in the oven, and you grill. BORING! At this age, a child should be able to assist you by using a knife, provided you have shown him how to chop….slowly…and with great care. Tweens can also place cakes in the oven, given the fact you have instructed her to NOT put her face near the blast of heat. If you are still leery, at least allow your tween to measure the ingredients and to mix. Being involved is fun. Parents don’t realize how much their attitude affects a child’s perception of a task. The bottom line: if you have a good time while cooking, your child will most likely have a good time too. When my own children were tweens, I would play our favorite songs while we cooked their favorite foods.